Vendors will provide their own tables, chairs, and exhibit tents, unless previously arranged with The Gear Closet. No electrical outlets will be available. Each vendor will be responsible for the setting up and breaking down of their area, and it would be much appreciated if there is no trash left behind afterwards! Setup will begin at 8:30AM and no booth should be taken down until 2PM once the event is over. Vendors and Exhibitors are responsible for their own merchandise. The Gear Closet is not responsible for lost or stolen items. Parking will be available next door at the Volunteer Behavioral Health Care System lot on the Chilhowie Street side of the building. No vehicles in the exhibit area during the Expo, please. The event will happen rain or shine, however, in the unfortunate case that the weather is dangerous then it will be cancelled. For more info, please email jenn@caribbean-sea.org or call the Gear Closet 423-413-3298. Please stop by the shop and welcome Stephanie Bailey as our new Manager! She is an outdoor enthusiast with an eye for art! We are all very excited she has joined our friendly Gear Closet crew! 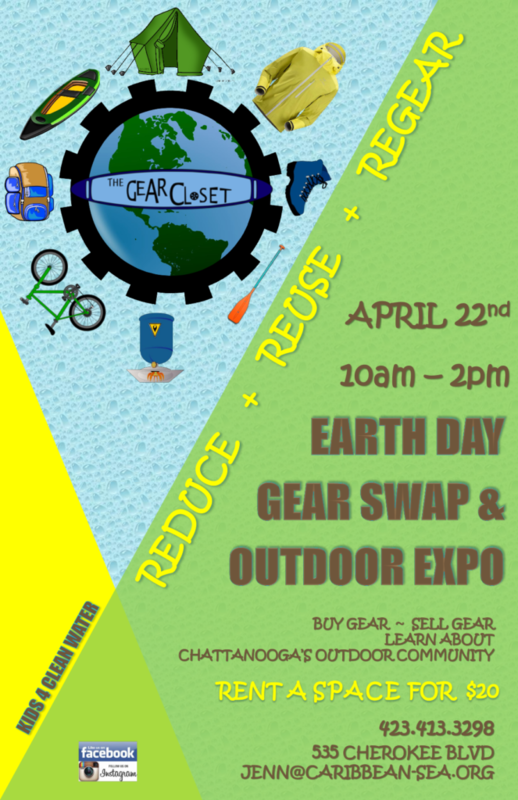 Want to help support Kids 4 Clean Water and the TenneSEA Student Environmental Alliance? Donate Here!